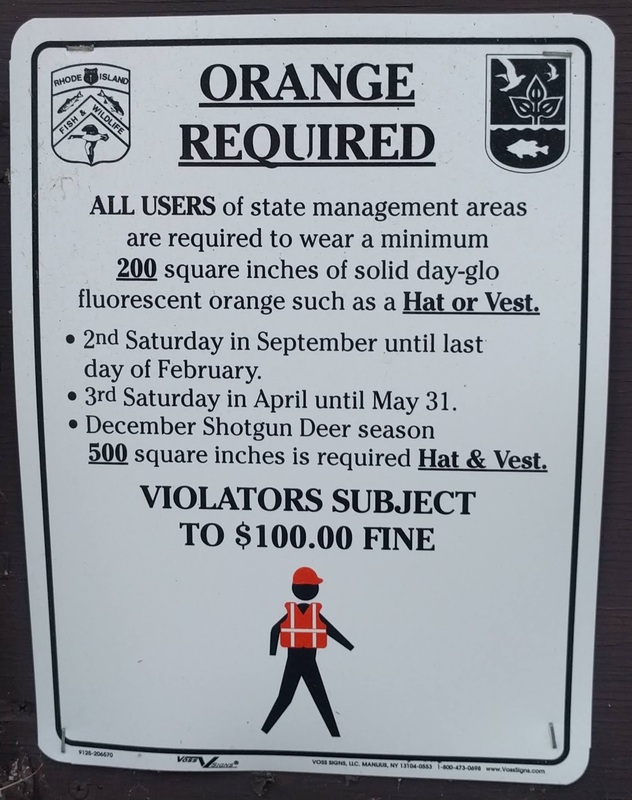 For all visitors to RI forests where hunting is allowed (most of them) the wearing of hunter safety orange is required by law starting September 8th 2018 and running until February 28, 2019. The second second season runs from April 20, 2019 through May 31, 2019. Fluorescent hunter orange must be worn above the waist and be visible in all directions. Examples are: a hat that covers 200 square inches or a combination of hat and vest covering 500 square inches. Fluorescent camouflage does not meet this requirement. I’m not sure the math actually works out but I’ll take their word for it (a hemisphere 11.4 inches in diameter is 200 in2, and that’s a huge noggin). I’ve created a Google Calendar showing the dates and amounts to make it easy to know how much and when.